Have you seen Calvary Cemetery lately? The new Garden of Angels Mausoleum, the Flower Gardens, the new Veterans Circle and much more! It's no wonder it is considered by many to be "Blair County's Most Beautiful Cemetery!" Calvary Cemetery offers monuments for ALL Cemeteries through our subsidiary, Calvary Family Services. We offer monuments made right here in the U.S.A, as well as fine imported granites. 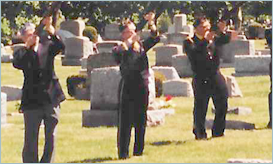 At Calvary Cemetery, we are proud to offer a beautiful Veterans section for Veterans and their spouses. The American Flag flies proudly here at Calvary Cemetery. Serving your community and all Faiths for over 100 years! Calvary Cemetery's beauty and tranquility has been attracting families for generations. Our beautiful grounds and gardens provide a private and peaceful atmosphere, to not only memorialize your loved ones but also to console the bereaved. 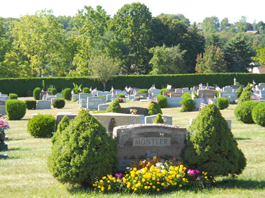 Whether it's pre-need arrangements, memorial merchandise, a tour of our grounds or to speak with one of our professional counselors, Calvary Cemetery offers you only the best in this area! We will be happy to meet with you and your family to assist in any way and to answer any questions or concerns that you may have. Calvary Cemetery has expanded its development in recent months to open new areas, including the Veterans Circle, Garden of Angels Mausoleum and additional ground areas for burial. Our cemetery is designed and developed to continually provide the very best for your loved ones, as well as for you, during your visits! 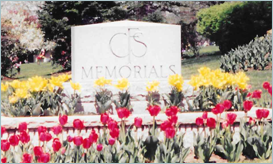 Calvary Family Services, Inc., (CFS) established June 1, 1989, is a subsidiary of Calvary Cemetery that offers Cemetery Memorials, Caskets and Cremation products for all area cemeteries and for our Calvary clients as well! Copyright © Calvary Cemetery 2016. All rights reserved.